At 80 Kms from Rome (to North) stop to "Orvieto". Going out of the toll gate turn left and follow the signs to "Civita di Bagnoregio". Stop to Orte, turn left and get the highway to Viterbo . 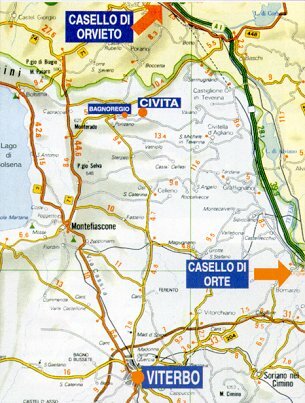 At the exit to "Siena Cassia" go on up to Montefiascone,then take the SS 71 Umbro-casentinese. After about 14 kilometres turn right to Bagnoregio. driving on the Cassia from Viterbo towards Siena, at Montefiascone take the SS 71 Umbro-casentinese. After about 14 kilometres turn right to Bagnoregio. Stop to "Orvieto" station. 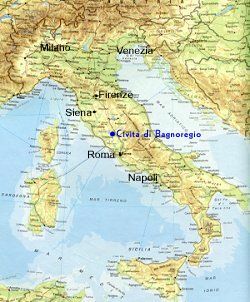 Take the bus to Bagnoregio. 6.20 - 7.20* - 7.50* - 9.10 - 12.40 - 13.55 - 15.45 - 17.40 - 18.20. 5.30 - 6.35* - 6.50 - 9.50 - 10.15 - 13.00 - 13.35* - 14.25 - 16.40* - 17.20. 5.10 - 6.40 - 7.15 - 7.45 - 8.10* - 10.00 - 13.00* - 13.05 - 13.35 - 14.50 - 1635. 6.10 - 7.20 - 8.15* - 9.00 - 10.50 - 11.00 - 12.10 - 12.30 - 12.55 - 13.50 - 14.15** - 16.35** - 17.15 - 18.10 - 18.30** - 19.30**. 5.10 - 7.05 - 7.35 - 8.10* - 10.00 - 13.00* - 13.40 - 14.50 - 15.30*** - 16.35. 6.30 - 7.45 - 9.25 - 9.50* - 11.25 - 13.30 - 13.20 - 14.00 - 17.00 - 18.35.
www.civitaaccommodation.com is not risponsible for possible variations or imprecisions due to the transport company. 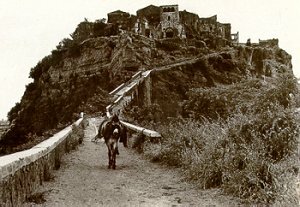 Up to ten years ago the transport of goods from and to Civita was effected by donkeys. 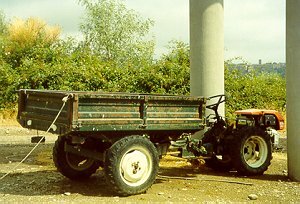 At present, the goods are carried by this small 4 wheel drive tractor, even though most of the few inhabitants carry their daily shopping walking. This is the only authorized tractor for the transport of goods. Only in cases of particular need the local authorities allow other means of transport to go over the bridge. 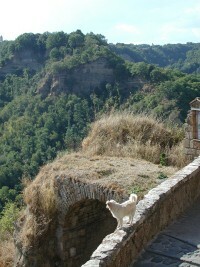 It is for this reason that it is possible to get to Civita only walking, going up the new bridge built in 1962. 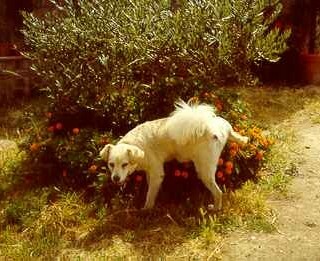 This is Birillo, the only dog present in Civita.